Durable & safe play dishes for your children, "BPA Free"
Every child loves to play house. Kids love to sit down and enjoy imaginary dinner with their grown-up family. Of course, to have a proper play dinner, a kid needs play dishes. That is where the KiddyPlay 29 piece Deluxe Dishes Set comes in! With four complete place settings including all of the dishes your kids will need, they will be ready to serve up pretend meals at any time. 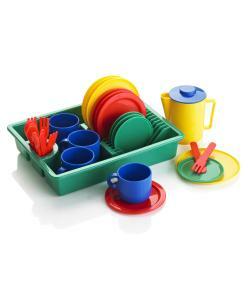 This children dish set toy is brightly colored and fun to use. When the party is over and they are all done, your kids can pretend to wash their dishes and place them back into their durable and realistic plastic dish drainer! 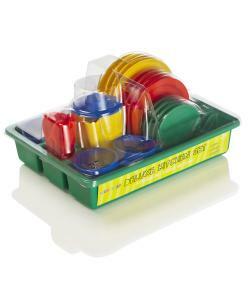 Sturdy and Safe: This dish set toy is made of heavy and sturdy plastic and contains no small parts. 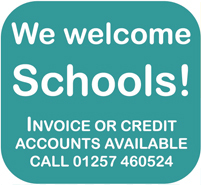 It is completely safe to use and contains no BPAs. It meets all safety standards for a toy of its type. This means that while your children play house and serve imaginary dinner, you can have the peace of mind knowing that their play is safe and sound. The KiddyPlay Deluxe Dishes Set will provide hours of fun and enjoyment for all kids (and their parents) ages three and up!